A study conducted by the Connecticut Department of Transportation estimated that the state could raise approximately $1 billion annually using all-electronic tolling on its highways. CTDOT added that its report examined options for implementing tolls in Connecticut that would help pay for needed transportation infrastructure improvements and demonstrated that a statewide all-electronic tolling system on limited access highways could raise substantial revenue with low rates for Connecticut drivers who would be offered a discount for using a Connecticut-issued E-ZPass, plus a commuter discount if they use the highways frequently. Without a Connecticut E-ZPass, the agency said; thus out-of-state drivers would pay more and CTDOT estimated that about 40 percent of toll revenue would come from out-of-state cars and trucks. The agency noted that for purposes of its initial analysis, toll rates were developed that might be as low as 3.5 cents per mile for a frequent off-peak car driver with a Connecticut E-ZPass – pointing out that the average trip made by a Connecticut driver on limited access highways is 12 miles. With discounts, a 12-mile toll trip would be 42 cents off-peak and 53 cents during peak hours, CTDOT said, while charging higher rates during peak traffic periods and lower rates in the off-peak will help reduce congestion during the peak period. No cash toll booths or toll plazas would be built across the highway; rather tolls would be collected via electronic sensors mounted over the highway on special toll gantries. As a result, vehicles would not need to stop or slow down, so there would be no traffic delays or accidents associated with older toll systems. A cashless All-Electronic Tolling or AET system equipped with electronic toll readers and cameras mounted overhead would “read” E-ZPass transponders and photograph license plates of vehicles driving by at normal highway speeds. Vehicles not equipped with E-ZPass would still be able to use the toll roads and be charged accordingly via video imaging of license plates, with billing and payment conducted by mail or internet. Cash would not be accepted, the agency added. spaced 6 to 8 miles apart along the state’s highway. 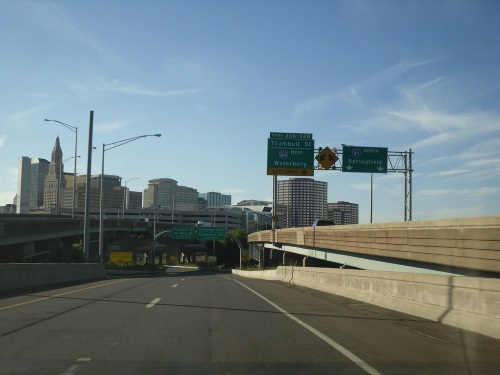 Due the numerous exits on most Connecticut highways, it is not possible to place a gantry between each exit, the agency said, but spacing every 6 to 8 miles should “capture” most vehicle trips.